Their planes were supplied with a novel lever cap design for which they had filed for a patent in 1928. The lever cap is hinged about 1 inch back from the toe. The front part fits over the “hump” of the cap iron and applies pressure across the width. About 1 1/2” back of the tip are two “legs” which press the cutter against the frog. The “legs” at the pivot point apply pressure close to the start of the hump in the cap iron and this helps ensure the blade is pinned firmly at this point, just as Leonard Bailey originally intended. Like the stay-set, the resulting improvement is hard to describe: the plane simply feels nicer to use – somehow more solid – when the two part lever cap in installed than when using a standard lever cap. Of course whether this is something you are willing to spend money on is a matter of personal choice, but I would say it is a far better solution than the recent enthusiasm for very thick cutters which achieve the same thing, but at the cost of more effort sharpening. In fact it is a rather good idea, and I think Leonard Bailey would have approved! I suppose we might ask why it was not widely copied. It is true that other companies would have been free to adopt the design from the 1950s after the patent expired, but as far as I know only one firm did (see below), and indeed Millers Falls dropped the feature in the late 60s. This is not necessarily evidence of a poor idea though, since by this time the market had changed and creating low cost tools aimed at the DIY market was where the real money was. I suspect the Millers Falls lever cap was just one of the many casualties of the cost cutters at this point in time. Here is one of their inaugural adverts from September 1929 (below) which contains a handy demonstration of their invention. I have duly tried the test and can confirm it works (c.f the Record below, where the paper slip is at a jaunty angle – it moves easily – and compare it with the Millers Falls where the paper is held tight). A clear demonstration of the fact that that not only do thin irons bend under pressure from the lever cap, but that the Millers Falls lever-cap stops it happening. It is interesting – and perhaps charitable – of Mr Lee to attribute some of the challenges to increased customer expectations, but I wonder also if it was a reflection on the oft quoted view that hand-tool manufacturing standards had deteriorated significantly after the 1950s? Perhaps there was a good reason for the old practice of leaving castings out in all weathers to “season” after all. The good news is that this episode encouraged LV to take over plane manufacturing themselves, something they seem to have got very good at. I got in touch with Rob Lee of Lee Valley (Veritas) and he was kind enough to reply to my enquiries. 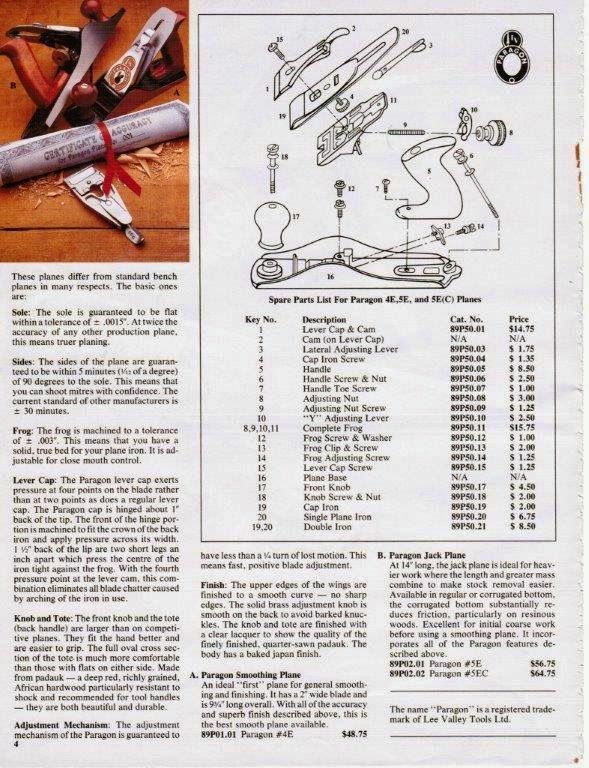 The disappointing news is they do not have any plans to reintroduce the 2-piece lever cap – one of the problems being that there is no standard for the set-back distance for the screw that retains the lever cap, so there would be no guarantee it would be compatible with most bench planes on the market. He also pointed out that, since MF planes do not command high prices, it would probably be just as affordable for those interested in the design to simply buy used MF planes for their caps, compared to the cost of a newly produced cap. Sage advice indeed, so make sure you get hold of yours soon before they are all gone! thanks for this article – very interesting and informative. I was looking for a little background on the Millers Falls lever cap and this answered all my questions.